Here is the starting point. 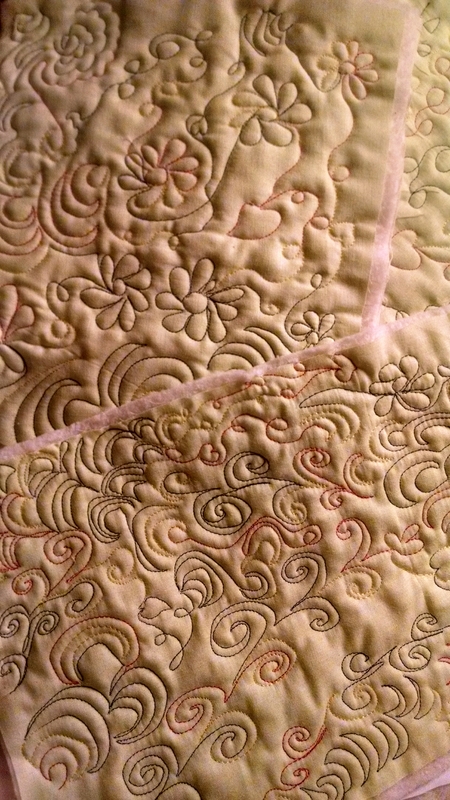 Class was wonderful fun, but to become accomplished at free-motion quilting takes a lot of practice. Learning to pace your machine to your movements is what it is all about, and what I will be struggling to learn. These are the practice “sandwiches” we were told to bring with us, made up of a backing, batting and front piece. The fabric can all be muslin, off course, which will keep the cost down and allows you to clearly see colored stitches. Mine were on a pale green, just because it is a color I like to look at. I’ve also started some thread painting on the sample below. Stitch length is not so important here, and it looks better with more layers, as opposed to the more controlled look I am trying to develop above. I used pins to hold this together, but this isn’t necessary on the small samples. The finished piece will appear soon, unless other fabric calls and distracts me. 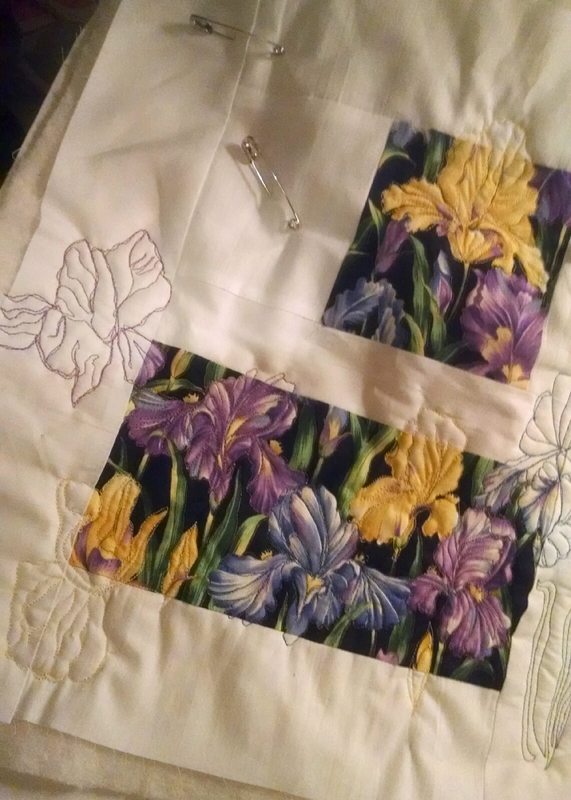 As I began my adventure into free-motion quilting I discovered a “market” for practice pieces that has spurred me on while waiting for my first class, next week. 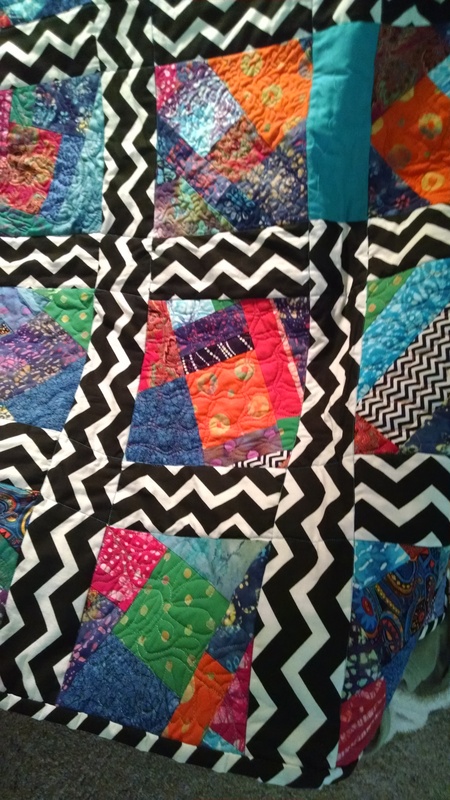 A local women’s shelter requests baby quilts and usually receives basic tied quilts, so my efforts at free-motion quilting are well-received. Earlier this year a bag of beautiful, bright and unusual scraps, called to me for this quilt. As they were picked up as remnants at a quilt show, they were in smallish pieces, so I decided to make them into crazy quilt squares. These brought to mind Baby Einstein products, so I used black and white to border and bind it. When the piecing was done, I had the fun part of practicing the free-motion skills I have been learning in books and on-line. I tried a different pattern in each square, and then decided I didn’t want to deal with the borders. Forgive me my perfectionist quilting friends. I do long to be like you, but knew that I had already failed on this number, so was ready to move on. I called it finished. There are better efforts at craftsmanship to come, but I liked the basic idea and also want a record of my progress, so have included it.